The Democratic Party (DP; Mongolian Ардчилсан Нам, Ardchilsan Nam) is a centre-right political party in Mongolia. After the 1990 democratic revolution, Mongolia became a country with a multi-party system. The democratic revolution transformed Mongolia from a single party communist regime into a dynamic democracy. Those who pioneered the democratic revolution founded Democratic Party, Mongolian National Progressive Party and Mongolian Social Democratic Party. On 6 December 2000, five political parties – including the Mongolian National Democratic Party, Mongolian Social Democratic Party and others merged and established the Democratic Party of Mongolia. On 1 April 2006, a party convention elected Tsakhiagiin Elbegdorj as the Party Leader. Four candidates ran for the elections and in the first round, Elbegdorj won 46%, Erdeniin Bat-Uul won 40% and two other candidates won the rest. Without an absolute majority, a second ballot between the leading candidates resulted in Tsakhiagiin Elbegdorj winning with 57.2% of votes. On 30 August 2008, the National Consultative Committee of Democratic Party elected Norovyn Altankhuyag as new leader of the Party. In the 2004 Mongolian parliamentary elections, the party was a constituent part of the Motherland Democratic Coalition that won 44.7% of the popular vote and 34 out of 76 seats at the Parliament. Party leader Tsakhiagiin Elbegdorj became the prime minister of a grand coalition government and held that position until January 2006. In 2005 Mongolian presidential election, its candidate Mendsaikhany Enkhsaikhan won only 19.7%. In the 2008 Mongolian parliamentary elections, the Democratic Party won 28 seats out of 76 in the Parliament. After the elections, two major parties (Democratic Party of Mongolia and Mongolian People's Party) formed a coalition government. Within the Government, Party leader Norovyn Altankhuyag became First Deputy Prime Minister and the Party keeps the seats of Finance Minister, Health Minister, Minister of Environment and Tourism, Minister of Roads, Transportation, Construction and Urban Development, and Minister of Defense. At the Democratic Party's convention on 3 April 2009, Tsakhiagiin Elbegdorj defeated Erdeniin Bat-Üül in a contest for the Party's nomination for the Presidency of Mongolia in 2009. Elbegdorj won with 65.3% of the total vote. After Elbegdorj was announced as the candidate, the Civic Will Party and the Mongolian Green Party endorsed Elbegdorj's presidential candidacy. Tsakhiagiin Elbegdorj won the 2009 Mongolian presidential election on 24 May 2009 with 51.21% of the votes. Defeating incumbent president Enkhbayar who got 47.41%. Elbegdorj was sworn into office as President of Mongolia on 18 June 2009. In the 2012 Mongolian parliamentary elections, the Democratic Party won the elections and became the majority by winning 34 seats out of 76 seat in the Parliament. Party Leader Norovyn Altankhuyag became the Prime Minister. It formed a coalition government with the Mongolian People's Revolutionary Party with majority seats at the Government Cabinet belonging to the Democratic Party. 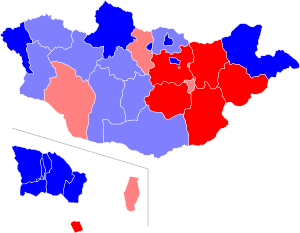 2013 Presidential election result: Provinces and Ulaanbaatar districts won by Elbegdorj (blue), Bat-Erdene (red). Darker shades represent a majority (more than half), lighter shades represent pluralities. The Democratic Party's National Consultative Committee held its convention on 7 May 2013 and decided to re-nominate Elbegdorj as a presidential candidate with 100% votes. And the Congress of Democratic Party, with 7,000 participants in Ulaanbaatar plus participants in all provincial centers connected via live internet video conference voted 100% for Elbegdorj's nomination from the Democratic Party for the 2013 presidential election on 8 May 2013. Civil Will-Green Party and Mongolian National Democratic Party - which have seats at both the parliament and the government cabinet - endorsed Elbegdorj's presidential candidacy. The Republican Party and the Motherland Party expressed their full support for Elbegdorj's candidacy also. In the 2016 Mongolian parliamentary elections, the Democratic Party lost to a landslide victory of the Mongolian People's Party, retaining only 9 of 76 seats in the Great Khural. While they just lost under 2% of the popular vote, a new electoral law passed by the Democratic Party itself when in Government to promote two-party politics, together with a 14% rise of the MPP, ended up making them lose 25 of 34 seats. The party is organized on national, provincial, municipal and district levels. Currently, the party has around 30 provincial party associations and 432 grassroots organizations. National Convention (NC): Each provincial association sends delegates to the National Convention, which is held every 4 years. National Consultative Committee (NCC): No more than two times a year, NCC is organized and there are 228 members of NCC. Affiliated organizations Democratic Party has the following affiliated groups and organizations. ↑ Julia Bader (2015). China's Foreign Relations and the Survival of Autocracies. Routledge. p. 88. ↑ "Mongolia's new president sworn in". euronews.com. 18 June 2009. Retrieved 25 June 2013. ↑ "Mongolian opposition wins landslide, voters fed up with hard times". Reuters. 30 June 2016. Retrieved 27 August 2016. 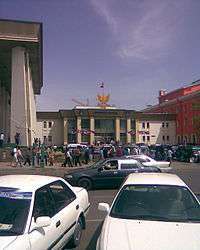 Wikimedia Commons has media related to Democratic Party (Mongolia).